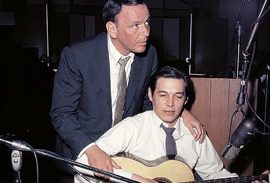 More than any other Brazilian song, The Girl from Ipanema by Antônio Carlos Jobim (1927–1994) represents the sound of bossa nova, which was created in the 1950s and traveled triumphantly across the world in concert halls and on television and radio in the decades that followed. The film tells the story of the countless international interpretations of such legendary songs in the simplest way imaginable, resulting in the ultimate compilation film. An old master of Brazilian cinema, Nelson Pereira dos Santos, and Dora Jobim, the musician’s granddaughter, approached their task with love and bravura. They hope their film will help revive bossa nova, which has fallen somewhat into obscurity. With no interviews or commentary and just a few photographs, the film thrives entirely on concert footage and jewels from the archives. The ecstatic, witty exchanges between the diverse interpreters of the songs and period fashions culminate in a grand carnivalesque finale. Nelson Pereira dos Santos is considered to be one of Brazil’s most important cinema directors. He was one of the precursors of Cinema Novo. His film Barren Lives is possibly the most highly awarded Brazilian film of all time. In 1955, at the age of 27, he made his first feature length film Rio 40 Degrees. In 1985, Pereira dos Santos directed a four-hour long documentary about Tom Jobim for Brazilian television. Throughout his career, he has made over 20 films, including Gold Mouth, The Amulet of Ogum, Hunger for Love, How Tasty was My Frenchman, Jubiabá, Tent of Miracles and Memoirs of Prison.